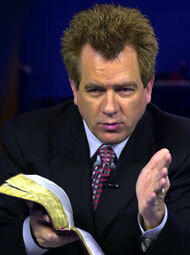 Popular gospel communicator and TV talk show host Bill Keller calls it "trash." And of course that’s putting it politely. What alleged author Michael Baigent has come up with in his "The Jesus Papers" is utter rubbish of the worst order. Of course, then again there are many "out there" who have no idea whatsoever as to the Jesus truth as presented in the Bible. They know there’s a Bible. They have a muddled idea about Jesus. But don’t mess them up with the historic detail. With that for a reading public, Baigent will sell plenty of copies for cash inflow and then walk all the way to hell with the bank. God bless him. "Michael Baigent has co-authored numerous books over the years where he proffers his own personal theories that directly contradict the Bible. He is the one who first proffered the ridiculous theory 20 years ago that Jesus and Mary Magdalene were married, a theory Dan Brown carried forth in his book the ‘Da Vinci Code’ where he had at least enough honesty to put on the cover his book was ‘A Novel’ or a work of fiction." Then comes along Baigent riding on Brown’s coattails. Is the public thirsty enough to go to the empty well? No doubt. Another coffee table book. Another conversational round at the water cooler. Another way to sound religious while not quite getting there. crucifixion, meaning he did NOT die on the cross, did NOT die for the sins of all mankind, was NOT God, and was nothing more than a conman. Not only does the Bible, but contemporaneous historians like Josephus, Pliny, and Tacitus confirm the death of Jesus, so Baigent’s ‘Jesus did not die’ theory makes them all part of some grand conspiracy." When it comes to biblical truth, Keller is not only on top of it, he’s all over it. And in that his ministry expands because there actually are those out there who want more then tripe for religious publication. They want to know what gives eternally. What history really relates. What is God-honest actual. In that, Keller exceeds. He will not compromise truth but instead will lay down his life for the eternal verities. Keller expands his opinion of the new sell: "Baigent’s blasphemous theory denying the deity of Christ makes this book something the public needs to be warned about. Michael Baigent is nothing but a tool of satan who will help lead millions of people to hell for their rejection of Jesus." True. And now with that covered, Keller gets into what really fires him up—the giving forth of Truth in Christ who saves the soul from sin and prepares one for heaven. Bill Keller, founder of Liveprayer.com, shines quite brightly each night. He will go national with his late-night talk show, "Liveprayer With Bill Keller." Already he has 250,000 viewers in Florida alone. Sixty million prayer requests flood into his web site. He has more than 2.1 million email subscribers and climbing. He is said to have the "most successful online Christian outreach in history." "The Lord has guided me all along the way," Keller states. Starting in 1999, working with volunteers, Keller and friends have connected with over 60 million prayer requests globally. Keller has sought out the forgotten, lonely and stranded. His Christian ministry particularizes itself to the person on the edge, that individual who thinks there’s no way out. Keller points them to the gospel in Christ. With that, he continues to seek divine direction for his expanding audience. He has a particular burden for the lost who have no inkling of locating a local church for worship. His aim is to fence in for the Lord those who cannot find The Way. That’s why he finds the night hours especially inviting. They are the times when worried persons cannot sleep. Their minds are wandering thither and yon. In that search, Keller prays to find their souls for salvation. Many come upon his ministry by surfing the Internet. They are bored. They are just putting in time. And then they come upon Bill Keller. "The Holy Spirit directs them to what we have to offer. And what we have for them is the old-time story that never grows old. It is the message of Jesus Christ and His love." Keller has been ministering through prayer lines over the years. He had "Live Prayer with Bill Keller," a sixty-minute TV talk show on select stations in Florida. In that venue, Keller provided intercession for those seeking spiritual aid as well as offering advice in navigating the Christian life. It was not long until there were more than a quarter million viewers per night in Florida alone. Keller’s ministry style is dynamic while compassionate. "I’m sold out to what I do. And what I do is for the forevers. I can’t lose with that my goal. And in that God is blessing. His smile rests upon our work for we are simply a humble lot doing the business of the cross." In that kind of heart-reaching-out connecting, Keller comes upon one by one those who just need someone to listen, to talk to, to hear out, and finally to point them in the right direction. With Keller, there is no question as to that direction. It is upward and outward. It is coming to know God in Christ. It is the Bible Way. It is what the Lord has had for us all along but it takes some people a long-way-around to find it. Keller is patient in that long-way-around. And that’s why he’s staying up nights to make friends for Jesus’ sake. And that’s why the thousands are listening in, viewing in, and coming to their senses in the Savior. That fires up Keller all the more to keep on keeping on. "Nothing like it," he exclaims. And of course that explains what drives Keller on to the heights with these new ventures. Then Keller also has a daily devotional to 2.1 million subscribers as well as more coming on board because of the increased TV exposure. Larry King, move over. Keller said. "We are convinced that with our national launch on PAX, Liveprayer will be one of the most cutting-edge outreach ministries in the world – and we say that with all humility because it has been God’s leading the entire way." Now can you also believe that with his retired clergy assisting, persons connecting with Keller get their own responses—40,000 each twenty-four hours? Is there a soul need out there or what? Keller is stunned. How can it be that he has been marked out for such an awesome ministry? No time to figure it out. It’s just that the Lord has His ways. And Keller says he’s praying daily to stay right there in the middle—of God’s perfect ways. For more information on the ministry of Liveprayer, visit www.liveprayer.com. Grant Swank has authored 5 books and several thousand articles in various Protestant and Catholic magazines, journals and newspapers. Grant is a regular contributor to WDC Media News and writes a weekly religion column for PORTLAND PRESS HERALD newspaper and is a graduate of accredited college (BA) and seminary (M Div) with graduate work at Harvard Divinity School. Web site columns appear on MichNews.com, CCNews.com, MosqueWatch.com, NewsByUs.com, AmericanDaily.com, CAGE.org, Republican and Proud, Canada Free Press, FaithFreedom.org, TheConservativeVoice.com, ConservativeDiscussion.com, StuckOnStupid.Us, PostChronicle.com, Conservative Posts.us, Out2.com, MensNewsDaily.com, Right Wing Conservative, LibertyNews.us, Religious News Online, among others. He has been married for 43 years and has 3 adult children. He is Pastor of the New Hope Church, Windham ME.